We want to keep our teeth. That’s really the bottom line. We want to be able to chew and talk naturally. This isn’t new; however for those who have lost a tooth, it’s a problem; a big problem!! And depending on how they choose to take care of this problem is can impact their life, literally. There are several ways to treat a missing tooth. Some options are merely better alternatives to having missing teeth and another is considered to be an actual tooth replacement. Bridges, and Partials and Dentures … Oh, MY! The best way to describe bridges, partials and dentures is that they are a better alternative to having missing teeth. Yet, they are not a true replacement. Bridges, partials and dentures replace the crown (or the top) of a tooth. But, they do not replace the foundation (or root). They do it by getting support from neighboring teeth. Why is this a problem? Well, teeth are designed with enough of a foundation to support themselves; but, not necessarily themselves and their neighbors. Over time, this can result in more time at your dentist’s office and more money spent to fix new problems. Before dental implants, any option would do more harm than good to some or all of the other teeth and bone in your mouth. First, the bone: The bone in our jawbones is important. Not only does it support our teeth, but it gives structure to our face. If the skin of our face was a beach ball, the bone would be the air. Take the air out and we lose the tight shape that our face started with. One of the great things about partial dentures is that it can artificially replace the support of the bone that has been lost. But only at the expense of the jawbone it rests on. As a partial denture rests on the jawbone, it actually causes the jawbone to resorb (or disappear) over time. This means that after an amount of time, partial dentures become unsteady because they will begin to rock and move around. When the denture doesn’t fit perfectly, it needs replaced. However, people don’t want to spend $1500 every couple years on new dentures. So, what do they do? They buy adhesives to try to get them to stay in place. The worse a partial denture fits, though, the faster the bone resorbs. Meaning it will be harder and harder to wear, and it will be harder to get a new denture that ever fits well, due to lack of support (because there is less bone). What if multiple teeth need to be replacd? So, if a patient needs all of their missing teeth replaced, what’s the best option? Treatment supported by affordable dental implants! The dental implants stimulate the jaw bone so that it doesn’t resorb and disappear, meaning longer lasting partial dentures! A “partial” denture, one that replaces some, but not all teeth, has the same problems with bone disappearing. Additionally, it is holding onto a patient’s remaining teeth for support. So, as the partial denture begins to rock and wobble due to lack of bone support, it starts twisting and yanking on the natural teeth in ways that nature doesn’t intend, causing all sorts of problems. Up to 40% of the teeth attached to a partial denture collapse and will be lost within 10 years. 60% of the teeth attached will have to be repaired (fillings, crowns, etc) within 5 years. Every time a tooth that is supporting them is repaired, the partial’s fit is less precise, meaning it will move around more and cause harm to the surrounding teeth and bone at an even more rapid rate. I mentioned that there was an actual “tooth replacement”. How does that work? Can a tooth really be replaced? If you are self-conscious because you have missing teeth or wear dentures that are uncomfortable, talk to Dr. Thomas Anderson to see if dental implants are an option for you. The option is a dental implant! Implants have become the top-of-the-line or gold standard for repairing a lost tooth because it actually replaces the tooth that was lost and saves you money over time. 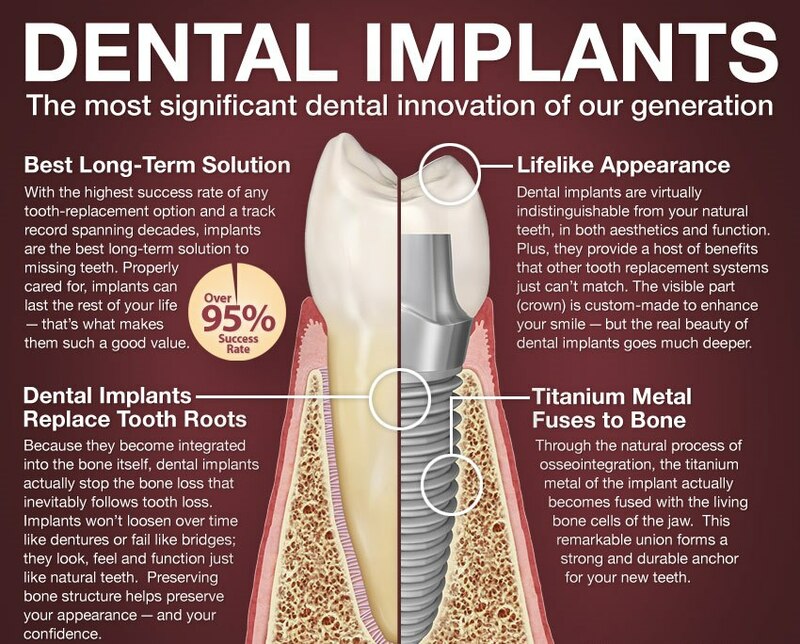 The actual dental implant is a titanium “root” that is placed in the area where the tooth’s root used to be. After healing, that implant can support a bridge, partial, crown, or full dentures without the risk of damaging the natural teeth in your mouth. The ideal situation with a partial denture would be to have a partial that didn’t rest on the bone or hold onto the teeth, but instead on the implants. The dental implant will keep the bone from resorbing and help support the partial, taking most of the unnatural stresses of the remaining teeth! We’ve covered some of the reasons to choose an implant-supported full or partial denture. Having a partial denture supported by implants, instead of teeth, means less cost and time at the dentist’s office having teeth repaired. It also means a longer lasting partial. Implant supported dentures will keep the bone that supports the denture from disappearing. You will have a denture that fits as well as it can, but your jawbone will have decreased in size so much that it will no longer fit. A denture supported by dental implants will last much longer. Dental implants are an effective and popular way to replace a missing tooth and are designed to blend in aesthetically with your other teeth. They are an excellent option to enjoy long-term for restoring your smile. As a matter of fact, the development and use of implants is one of the biggest technological advances in the dental industry in the past 40 years. Dental implants are made of titanium. They are surgically placed posts in the upper or lower jaw, where they become a sturdy anchor for replacement teeth. First, Dr. Anderson surgically places the implant into the jawbone. He may recommend a diet of cold foods and warm soup and soft foods during the healing process. Second, the bone around the implant heals. What makes an implant so strong is that the bone actually grows around it and holds it in place and can take some time. Some patients can have the implants and replacement teeth placed all in one visit. While other patients might need to wait until the implant is completely integrated, up to several months, before replacement teeth can be attached to the implant. Finally, it’s time for the placement of the artificial tooth/teeth. For a single tooth implant, Dr. Anderson will customize a new tooth for you, called a dental crown. The crown will be based on size, shape, color and fit, and will be designed to blend in with your other teeth. If you are replacing more than a single tooth, custom-made bridges or dentures will be made to fit your mouth and your implants. Note: The replacement teeth usually take some time to make. In the meantime, your dentist may give you a temporary crown, bridge or denture to help you eat and speak normally until the permanent replacement is ready. Aesthetically, they look just like a healthy tooth; but they also keep the jaw bone stable. If you leave a missing tooth and don’t replace it, over time the jaw bone will disappear. Of course, this can lead to functional problems. For example, there is nothing to support a denture in the future; little lone a dental implant. And now you have an aesthetic problem with your face. Because the jaw bone is what supports your cheeks, so the loss of it can lead to small changes, such as deepening expression lines in the face, or ultimately having the look of a collapsed jaw! Dental implants allow you to be able to chew your food without issue. Which is unlike regular partials or dentures, as fresh fruits, vegetables and nuts can be very difficult to eat. This lack of nutrition can be life changing. Dentures and partial dentures, supported by implants, can help restore the ability to eat these types of food and others with confidence. They are easier to care for too. Unlike bridges, implant-supported teeth can be cared for the same way as natural teeth, with a toothbrush and floss. Bridges require you to care for them differently. It can take patients a year or more to get used to trying to hold an upper denture in place. You have to train the muscles in your cheeks and lips to hold it in place while you eat and talk. As for the lower dentures, patients may never be able to get the hang of a lower denture, because tongues don’t want to share their space. Selfish tongues! Implant supported dentures actually “snap” into the implants and is held in place! How wonderful is this? Ask any patient that had conventional dentures and decided to have dental implants placed for better support and they will tell you it was the best decision they’ve ever made!! We know if you are currently or will someday be wearing dentures, implant supported dentures will be a great decision for you as well! Move forward with the best option for tooth replacement! If you are interested in dental implants, it’s a good idea to discuss it carefully with Dr. Anderson first. If you are in good general health this treatment may be an option for you. In fact, your health is more of a factor than your age. You may be medically evaluated by a physician before any implant surgery is scheduled. Chronic illnesses, such as diabetes or leukemia, may interfere with healing after surgery. Patients with these issues may not be good candidates for implants. Using tobacco can also slow healing. At the offices of Thomas L. Anderson and Associates, we like to use the treatment with the highest rate of success and studies show that a dental implant is just that. However, care must be taken to ensure that the area the implant is to be placed is in an area in good health. There are a lot of considerations and Dr. Anderson and his expert Team of dental professionals can help you make the best decision on this life-changing treatment. To schedule a consult, please contact us today. Contact us today to schedule an initial consultation and meet with any of our skilled dentists at one of our three conveniently located dental office locations within the Kansas City area, including Lee’s Summit / Independence, the Country Club Plaza and Downtown Kansas City. The gentle dentists and expert team at Thomas L. Anderson and Associates look forward to working with you to treat your dental emergency, achieve proper oral health and a beautiful smile that will last a lifetime. If you have any questions about your dental insurance benefits, please do not hesitate to contact us. We are happy to review your policy! Please give us a call today to schedule an appointmentand become part of our dental family.